Med-Lift - 3555 Two Way Reclining 500 Lb. Capacity Bariatric Power Lift Chair with Matching Arm and Headrest Covers - Aaron Cocoa Fabric - 3555-AAC Features. Two Way Reclining 500 Lb. Capacity Bariatric Power Lift Chair. 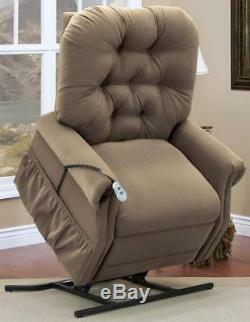 Lift chair with 2 way recline. Accommodates a person 5'2'' to 6'2'' tall. Hardwood frame and stress points. Constructed with heavy duty hardware. Corner blocks used throughout for added strength. Morley system, 9 gauge, no sag springs. Conjugated fiber used is dustless, odorless, and non-allergenic. Super Sag less lift base. Magazine pouch on lower outside. Comes standard with armrest and head covers. Ottoman height from floor: 21'. All fabrics used meets both CAL 117 and UFAC requirements for flammability. Optional 4 or 6 Vibrate/heat and additional magazine pocket available. Battery back-up is not available with 4 or 6 Vibrate/heat at this time. Seat height: 19.5''H. Depth: 42'' - 65''D. Back height from seat: 28'. The item "Med-Lift 3555 Two Way Reclining 500 Lb. Capacity Bariatric Power Lift Chair wi" is in sale since Tuesday, September 25, 2018. This item is in the category "Home & Garden\Furniture\Chairs". The seller is "fivestarsource" and is located in Orem, Utah. This item can be shipped to United States.